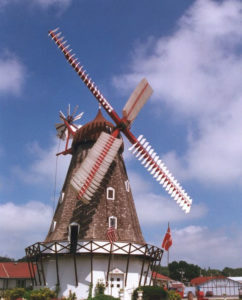 The cap moves toward the Danish Windmill. An historic landmark in the small western Iowa town of Elk Horn is getting a major facelift this week. 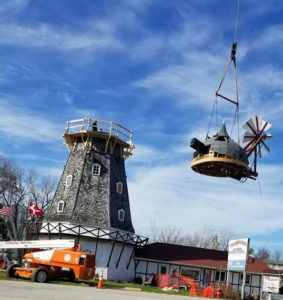 A Danish Windmill, originally built in 1848, is being outfitted with a new cap, sails, and other components so the mill will be turning in the wind again for the first time in two years. Lisa Steen Riggs, general manager of the Danish Windmill, says big problems were discovered in 2016 when the mill’s sails stopped turning. “We found wood rot where the two 66-foot sails cross,” Riggs said. “We knew we had to get them to the ground before they fell to the ground.” A massive crane arrived on Monday to place a 15,000-pound mill turret with the cap frame, wind shaft, brake wheel, and fantail on the top of the windmill. 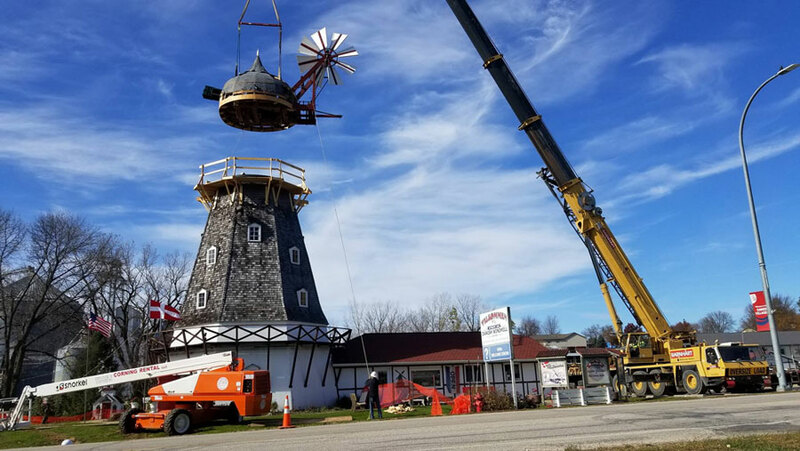 The sails that are being replaced today were installed as new when the windmill arrived in Elk Horn 42 years ago. The entire project carries a price tag of roughly $200,000. Volunteers are doing most of the work and donors are paying for the parts and specialized labor. Cap moves over top of windmill. 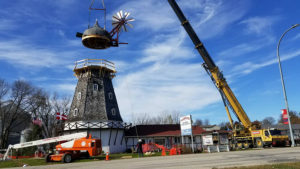 of all the new components for the Danish Windmill will be completed just in time for a 9th annual dinner and auction happening this Saturday to support the project. Elk Horn and the neighboring town of Kimballton are the two largest rural Danish settlements in the United States. Combined, around 1,000 people live in the two communities. The windmill in 2014 before renovation. According to Riggs, last year, over 57,000 people visited the Danish Windmill in Elk Horn – which is located six miles north of Interstate 80 in Shelby County.